Everyone knows that dead artists sell more paintings than live ones do. Jack Culross is an artist who puts that theory to the test. He fakes his own suicide, and sure enough, sales of his paintings go through the roof. Trouble is, he didn't let his wife, Edna, in on the scheme. When she sees a painting of his that she knows he didn't finish, she starts to get wise. Culross contacts Edna, but they fight and she knocks him down. Later, Culross is found dead for real and at first, Edna's brother is arrested for the murder. Then Edna herself stands accused. Perry takes the case and sets out to determine just who knew the "dead" artist was really alive before he was murdered. The painting The Three Witches also appears in #187, TCOT Reluctant Model. See appearances here. Submitted by Xanthippe Svanstr�m, 12/24/2003. Chuck Hamilton, as the Postal Inspector, makes his first of four appearances on Perry in this episode. Even though Mr. Hamilton made four appearances, this is the only one in which his name appears in the credits. Mr. Hamilton was born in 1903, and of this date is yet alive. Mr. Hamilton holds the present record for oldest alumni of the Perry show at 106 years of age. Submitted by PaulDrake 33, 6 August 2009. + NOTE: Chuck Hamilton died the day before Christmas, 1978, at age 75. Submitted by cgraul, 11/3/2011. + NOTE: According to the IMDb web site Mr. Hamilton appeared uncredited in nine PM episodes. The last one was TCOT Scarlet Scandal in 1966. Stuart Erwin makes his first of four appearances here playing Austin Durrant. From 1950 until 1955 Mr. Erwin starred in his own sitcom The Stu Erwin Show aka The Trouble With Father. Stuart Erwin was a long time actor who, believe it or not, was nominated in 1937 for an Academy Award in the supporting actor category [The movie for which he was nominated was Pigskin Parade. jfh 19Oct2018]. He lost out to Walter Brennan for Come and Get It. Mr. Brennan was also the star of an early television sitcom The Real McCoys. Submitted by PaulDrake 33, 24 November 2009. Sightings: Once again, the Little Old Lady in a Hat appears. As Hamilton Burger questions Lt. Anderson, we see her sitting in the back row during a cutaway of David (Gerd Helm) & Austin Durrant (Stuart Erwin) as they watch from the gallery. Submitted by Kenmore 9/13/2010. + Distinguished Gentleman #1 is also observing in the courtroom today. Read more about him and other regulars on the Who Is That? page. Submitted by gracep 12/1/2010. This episode makes the fourth appearance of Karl Held as David Gideon�which he will repeat another five times, for a total of nine. Submitted by gracep, 11/22/2010. Character Names: Clint Miller�s middle name is Robert. Submitted by gracep, 12/1/2010. Location: Durrant Art Gallery building was at 23732 Malibu Road near the intersection of Webb Way and PCH, which was down the hill just a couple of hundred yards from where Raymond Burr lived at the time. Its currently Pritchett Rapf Reality. Posted by Eric Cooper, 10 April 2010. When Hutchings slams the door at the end of the scene where Paul and David interview him outside his apartment, the entire wall behind him (look closely) vibrates. Shoddy construction I guess. Submitted by daveb, 4/14/2011. Location: About 6 minutes in, there is an exterior shot of Malibu Road and then, as the guy enters, �24246� is visible on the gate where Jack Culross is painting. All this makes perfect sense. The house still exists and is just a few houses south of where Raymond Burr lived at the time making the shoot very easy for him to make his call time. Submitted by Eric Cooper, 23 May 2011. Some pictures here. 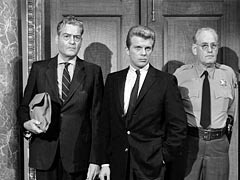 + Since Raymond Burr didn't appear in that scene, he didn't have to be there at all. Submitted by Wiseguy70005, 2/23/15. While Edna tells Perry her story, on the desk sit a cup and saucer from the Curious Coffee Set. Submitted by gracenote, 6/21/2011. Once again, there is no Lt. Tragg even though Ray Collins receives credit for playing him. Submitted by gracenote, 6/21/2011. CARS. (1) 1959 Buick Invicta Convertible, medium color w/similar color top, Lic No VBZ 553, Jack & Edna Culross. Seen several times, top up or down, with three different drivers. Invicta badge on fender forward of front wheel can be seen at 24:14. Invicta was the mid-range Buick series from 1959-63. It had a higher trim level and larger engine than LeSabre. (2) 1961 Ford Fairlane 4-Door Sedan B&W, "SHERIFF" & star on door, Lic No E 014. (3) 1961 Buick LeSabre Estate Wagon light color w/factory roof rack, Lic No VJP 181, Austin Durrant w/ "Durrant's Art Galleries" on the front doors. (4) Perry's all-white 1961 Lincoln Continental Convertible, top up, Lic No VUD 434. The two Sheriff's Deputies are wearing LA County shoulder badges but yet again have incorrect Cap Badges (#'s 2336 & 6358). They should be wearing the LA County badge that Gordon Jones wore in Ep#113. Another improperly dressed Deputy was in Ep#106. Added by Gary Woloski, 1/30/13. + Actually, three different notes were involved. The two with the hyphen are also different. In the first one, the horizontal lines of the 'E' are not parallel to the top of the page, the letters are taller and the hyphen is shorter and extends from the center of the 'A'; in the note the man hands to the police the letters are shorter, the hyphen is longer and extends from the bottom of the 'A.' Submitted by Wiseguy70005, 2/23/15. Another inaccuracy from "two of [Perry Mason's] greatest fans" in the description of this episode. The book states that Edna "got wise" to the fake suicide from seeing the finished painting. Actually, she thought the painting was a fake, as she later tells Perry Mason in his office. [And don't say the book was written before the episode could have easily been viewed by the writers. VCRs were available (though expensive) during the time the book was written and "two of his greatest fans" certainly should have been familiar with an episode which had been in syndication for the previous 20 years.] Submitted by Wiseguy70005, 2/23/15. "A Scarring Coincidence." Two actors in this episode bear noticeable facial scars on their right cheeks. George Macready, whose scar is one of the most famous (and pronounced) in Hollywood history, got his after a college car accident, and being sewn up by a veterinarian. Britt Lomond got his in battle during World War II. Submitted by BobH, 8 March 2017. ++ the unISness of it all one of the resolutions is that Durrant (Irwin) is to be charged with fraud, but is he really guilty of that ?? It's true that he participated in a deception, but did it rise - descend?? - to the acutal level of fraud: after all, as Perry pointed out, people purchased genuine paintings...the deception affects whether/not they will rise in value. But speculative losses usually aren't recoverable (would someone be quilty, for example, if they falsely announced they intend to retire...and then didn't). An interesting question on the fine points of the Law, for modern day Perrys - or Davids - to weight in on. Pondered by Notcom, 013018.